The European Elections will take place in May and most parties already announced their Spitzenkadidat. As Jean-Claude Juncker is not seeking a second mandate, a new face will represent the European Union. And according to our 2019 European Commission President odds, Margrethe Vestager is likely to succeed the Luxembourgish politician. Since 2014 that each party nominates a Spitzenkadidat (lead candidate) for the Commission leadership. After the elections, the parliament will approve the new President by an absolute majority. This is a similar process to the national democracies. The candidate of the party with a majority usually becomes the head of the Commission. This process, however, has generated controversies, facing some opposition. But the Constitutional Affairs Committee has issued a statement that it cannot be overturned and that the Parliament is prepared to reject any candidate who is not a Spitzenkandidat. Still, some parties like ALDE released a list of candidates, instead of just one. These elections will be especially important as they will see the end of the dominance of the EPP and the S&D. The two parties shared the Commission’s top jobs. But now, they are unlikely to win more than 50% of the votes. In this way, the electoral prospects in May are very unclear, as it is the leadership of the Commission. On our analysis of Danish Politics, we already predicted that Vestager is very likely to become Juncker’s successor. She has Emmanuel Macron’s support, a reason why ALDE might also be close to becoming the second-most voted party in these elections. But Margrethe Vestager has years of experience as a politician. She is the European Commissioner for Competition since 2014, after serving as a Minister of Economic Affairs and the Interior in Denmark. 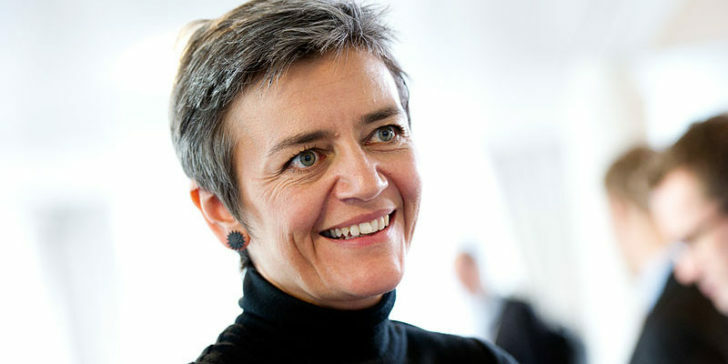 Vestager was also the leader of the Danish Social Liberal Party between 2007 and 2014. She has built a very strong reputation in recent years. This is especially because of her fight against tax avoidance by big corporations. Which made her the most popular figure of Juncker’s commission. She was essential in addressing companies like Amazon or McDonald’s. And she issued Ireland – coined as corporate tax heaven – to demand Apple to pay $13 billion in taxes. The tech regulator is highly committed to the cause and recently, Google was again one of her “victims”. She is very likely to gather a lot of support in the parliament, not only from ALDE but also from different parties. Her odds of becoming the next European Commission President are 7.00 at 22BET Sportsbook. Frans Timmermans is the Socialists’ Spintzekandidat. The Dutch politician has been serving as the First Vice-President of the European Commission, Juncker’s right-hand man. This is why he is somehow a natural successor, even though polls’ indicate that the party will have its lowest performance ever in the elections, losing over 50 seats. He has been warning about the consequences of the nomination of Manfred Weber, as he has been involved in some controversies. Weber showed close ties with politicians such as Viktor Orbán. And his position against the prohibition of gay conversion therapies didn’t gather good reactions. This is why Timmermans might succeed. He is outspoken about the consequences of a possible ascension of nationalism in Europe – which is one of the main topics on these elections – and as they approach, he keeps on trying to keep democracies intact across Europe. He will certainly have the support of liberal sectors in the parliament, especially those willing to keep the European values alive. This way, his odds (10.00) of becoming the next EU Commission are not that low at online sportsbook sites in Belgium. Manfred Weber defeated fellow EPP member Alexander Stubb to be the party’s head candidate for the Commission leadership. He is currently the party’s Charmain and has the best odds at 22BET Sportsbook. However, online sportsbook news sites in Belgium report that there are some conservatives who are skeptical about his nomination. Juncker himself has detached from Weber, refusing to publicly endorse him. Additionally, he has no executive government experience, which makes him vulnerable as opposed to the candidates mentioned above. Besides, the German influence in Brussels has been widely contested. So the parliament might not elect another national, as the Secretary-General of the European Commission is Martin Selmayr. This is why our betting preview indicates that he won’t be the first choice to take the position, despite his odds of 1.83.